Many of my younger colleagues in journalism – which amounts to almost all my colleagues in journalism these days – have no memory of a time before smartphones, emails, Facebook, Storify, Twitter, Reddit or even the Internet. No personal computers, no laptops, not even a noisy fax machine spitting out pieces of paper with a nasty chemical smell. In my first job in the newspaper business, I wrote to the clackety-clack tune of a teletype machine, which was about as high tech as it got in those days. It transmitted words over telephone lines! Imagine that! Before you start to think I am some old crank going on about the good old days, believe me, I'm not. I would have loved to have had all the technology that is available today. In those days, it was a tough slog, gathering information, compiling it by hand and writing it on paper that often had a sheet of carbon paper underneath to make a second copy. Too tough. But you could pick up a newspaper right off the press and smell that delicious printer's ink smell. It was fun. Most days. Other days, the lack of technology was a pain in the neck – even though we really didn't know what we were missing. Who did? Here's a story about how, in 1983 – eight years before the launch of the World Wide Web – the absence of advanced technology cost my employer, then the Cincinnati Enquirer, a few thousand bucks and wasted an entire day for a task that today should have taken maybe an hour. In the summer of that year, I was covering the aftermath of a very tragic story – the Air Canada disaster. It took place late in the afternoon of June 2. An Air Canada DC-9, flying from Dallas/Fort Worth to Toronto, had a fire onboard that filled the cabin with toxic fumes. An emergency landing was made at the Cincinnati/Northern Kentucky International Airport. Ninety seconds after the plane touched down, it burst into flames. Twenty-three passengers lost their lives. 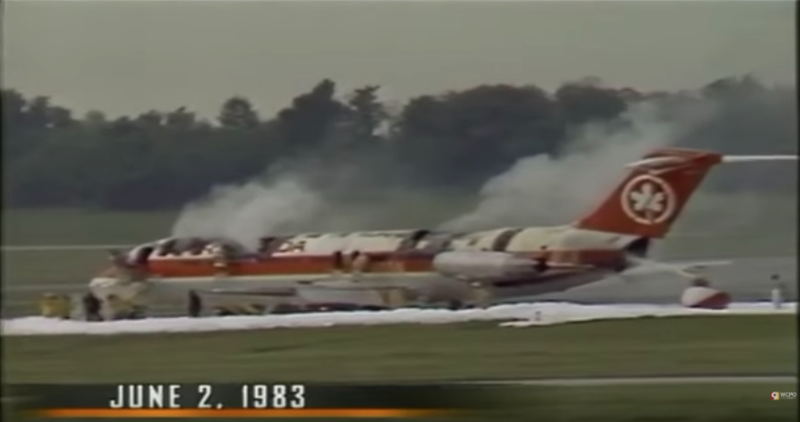 Flight 797 from Dallas-Fort Worth to Toronto/Montreal catches fire in midair and bursts into flames on CVG's runway June 2, 1983. Of course, there was an investigation from the National Transportation Safety Board (NTSB), which began immediately after the fire had been put out and the victims and survivors removed. About eight weeks later, the NTSB had concluded its preliminary report, which led to the adoption of new rules for airlines about the flammability of materials used in the passenger area and the installation of smoke detectors in lavatories. At the Enquirer, we knew the report would be available the next day at the NTSB offices in Washington, D.C. But how to get it? No faxes machines back then, no releases of documents on the Internet. All we had was Gannett News Service. The Enquirer was (and is) a Gannett newspaper, one of over 100 daily papers it owns. After Gannett took over the Enquirer in the late 1970s, there was really no need for an Enquirer Washington bureau reporter. The company had Gannett News Service, made up of reporters, photographers and editors. A Gannett News Service reporter was assigned to cover Washington for all of the Gannett newspapers in a state or states. 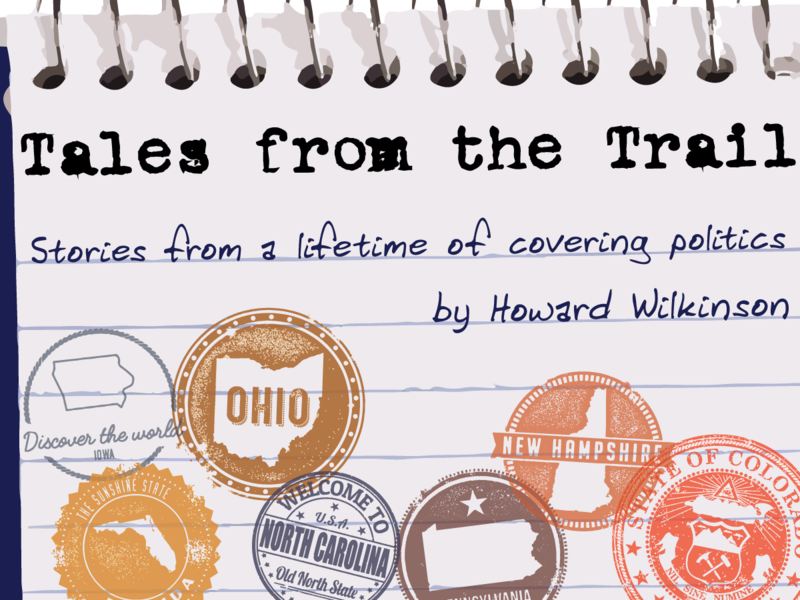 In those days, Ohio's Gannett newspapers – the Enquirer and several small-town dailies – had its own reporter. So, of course, our metro editor at the time – Jim Delaney – got in touch with his counterpart at Gannett News Service (GNS, as it was known) and asked that our GNS reporter go over to the NTSB the next morning, get the report and write a story for us that would go out on the GNS wire, which operated like a smaller version of the Associated Press wire. Absolutely not, he was told by the GNS editor. Our reporter was busy working on a special project and could not be bothered by the daily needs of the Cincinnati Enquirer. There were times when relations between GNS and the Enquirer (as well as other Gannett papers) were rather rocky. They engaged in more trench warfare than in coordinated (and cordial) cooperation. The request went up the ladder at the Enquirer and the answer was still no. The GNS reporter would not be doing the story. So the top editors at the Enquirer came up with a plan: They would put me on a Delta flight to National Airport (Ronald Reagan was president then, so the airport wasn't named after him yet). I would get a cab and go directly to the NTSB headquarters, which, if I recall correctly, was on Independence Avenue near L'Enfant Plaza in those days. I would pick up the document (after paying the Xerox fee) and immediately hail another cab to take me back to National Airport. There, I would climb aboard another plane, this one bound for Cincinnati, and once I was back in the old newsroom at 617 Vine Street, I would write a story for the next day's paper. It wasn't the perfect plan, but it was the only one we had. The only possible way to get the story. So the next morning, I drove to the airport. I took with me a little carry-on overnight bag, just in case something happened and I got stuck in D.C. I could always call in a story (reporters in the field often dictated stories off the top of their heads in those days). I got on my plane, bound for Washington, about 9:30 a.m. I got a cup of black coffee and a tiny bag of stale peanuts from the flight attendant, and in less than 90 minutes, I was on the ground at National Airport. I could skip over baggage claim (didn't have any) and raced outside to ground transportation. I got in line for a cab. It took maybe 10 minutes to get one and we sped off toward L'Enfant Plaza. I raced into the government building that housed the NTSB, found the proper office for copying documents and ordered up a copy of the just-released report. That process took about half an hour. I was soon back out on Independence, loudly and demonstratively hailing a cab. One pulled over in less than a minute. Delta terminal, National Airport, my friend! The cabbie high-tailed it to the airport and dumped me out. I paid my fare and left a most generous tip (the Enquirer editors slapped a wad of bills in my hand before I left, just in case). I had about 20 minutes before the flight (this is long before security procedures that make you take off your shoes and your belt, allowing you to amuse the security personnel as your pants fall down to your knees). That meant I had enough time to wolf down a pre-packaged ham salad sandwich and a Coke before boarding the flight for CVG. I got on board, buckled up and soon we were in the air. I got the report out, began reading it and taking notes; I pretty much had figured out what the story was going to say before we touched down on the runway. I raced to my car, hit the highway and took off down the Cut in the Hill to the Brent Spence Bridge and Cincinnati. I was back at my desk at the Enquirer, banging out a story by 3 p.m. – less than six hours after I had left Cincinnati, traveled well over 1,000 miles in the air, and raced around Washington D.C. in cabs. I filed my story with the editors; they were happy with it. The only thing they weren't happy about was the fact that they had to shell out a hefty wad from the newsroom travel budget because GNS was refusing to cooperate. I was so tired I went home and fell asleep. I don't really remember, but I wouldn’t be surprised if I had dreamt that I had invented something called a fax machine. 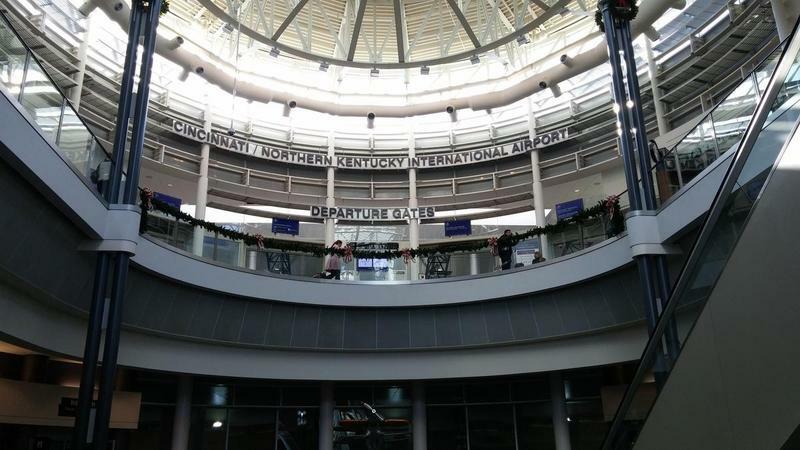 With new carriers and more flights, the Cincinnati/Northern Kentucky International Airport (CVG) served 7.8 million passengers in 2017, its largest volume since 2010. 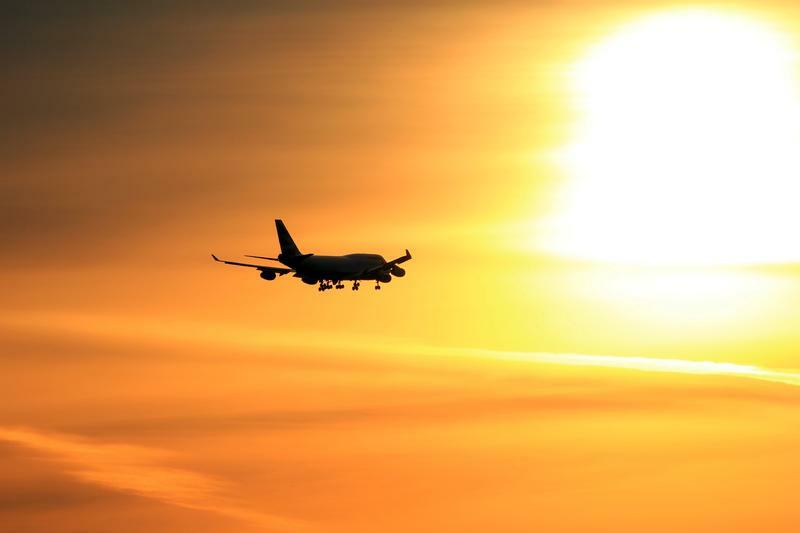 The airport also handled more than one million tons of cargo last year.